The Zulu are the largest tribe of Southern Africa and are renowned for their skilled artistry and craftsmanship, in particular their woven baskets. Every basket is made by hand using indigenous raw materials. It can take up to one month to produce a medium sized basket. Each is unique in size, shape, pattern and colour. 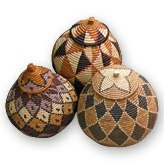 The Ukhamba or beer baskets are rendered watertight by the tightness of the weave and by the swelling of the palm material. These baskets are very decorative and colourful. Imbenge are small saucer shaped bowls also traditionally woven with palm material but a modern version has developed among urban based Zulu which is made entirely of recycled telephone wire. These brilliantly coloured and intricately patterned open baskets are very collectible. 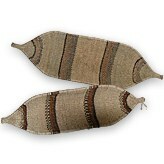 In addition to their beauty they are also very practical as they are sturdy and completely washable.